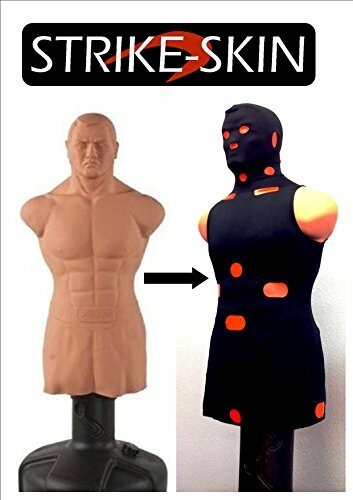 Strike-Skin is a "shirt like" self defense training tool that assists in practicing the visualization of precision strikes on a BOB torso training bag. Simply stretch Strike-Skin over your BOB and watch him transform into the most effective tactical training tool this century. The design of Strike-Skin clearly articulates striking targets so that when stretched over a BOB Punching Bag, they identify and highlight the size and location of the most vulnerable strike points on the human body. Strike-Skin is a great tool for males and females of all ages to practice punching or kicking techniques with more accuracy on their Bob ® Torso Training Bag. *Please note we do not sell the BOB Torso Training Dummy. If you have any questions about this product by Strike-Skin, contact us by completing and submitting the form below. If you are looking for a specif part number, please include it with your message.